3rd Principle: Human life is inherently creative. We create our lives and we can recreate them as we go through them. Instead, we have a culture of standardization. Finland doesn’t obsess over [math and science]. 1) They have a broad approach to education which includes humanities, physical education, the arts. 2) There is no standardized testing in Finland (a few tests but it doesn’t drive curriculum). 3) They don’t have a dropout rate. Finland [wonders]: Why would children dropout? When they are in trouble, we get to them quite quickly and support them. 1) They individualize teaching and learning. They recognize that it is students who are learning and the system has to engage them, their curiosity, their individuality, and their creativity. That’s how you get them to learn. A few years ago, I had a student teacher; it was one of the best teaching experiences I have ever had. The first semester we worked as a team: We had individual conferences and helped twice as many students because we were both in the room. So many things would change in education if that were the norm rather than the exception. We would have teachers accountable to each other; no one would be able to hide behind a closed door and call it anonymity. Students would have two teachers to talk to about learning issues. One teacher could teach while the other walks around the room monitoring individual learning. Teachers could have individual conferences with students about their writing or comprehension of certain concepts. Informal, diagnostic evaluations could happen every second of classroom time. As a parent of a child who is struggling in school, the team-teacher approach would have unlimited benefits as well. Having a 2nd teacher in his classroom–not support staff, but an actual trained teacher–would get him the individualized instruction he needs. As it stands now, he is lost and confused during most instruction. The classroom is not about his learning, but about the standard that is being taught–standards that become meaningless as he is increasingly distraught over his inability to keep up. 2) They attribute a very high status to the teaching profession. They recognize that you can’t improve education if you don’t pick great people to teach and if you don’t give them constant support and professional development. Right now, anyone can get into a teaching school. Teacher candidates could have been D students in high school, yet they are admitted into the teaching program. Those teacher candidates may have been average students in the teaching program as well, yet they can apply and be hired to teach our children. I want my child to have the best and brightest teachers, so their knowledge base is greater and their passion for learning is evident. I don’t want my son to have a teacher who thought teaching would be easy, or to have a teacher who wasn’t able to get into another profession. 3) They devolve responsibility to the school level for getting the job done. There’s a big difference with this and the systems that go into a system of command and control [America’s current system]: central government decides they know best and they are going to tell you what to do. The trouble is that education doesn’t go on in the committee rooms of our legislative buildings. It happens in classrooms and schools, and the people who do it are the teachers and the students, and if you remove their discretion, it stops working. You have to put it back to the people. As the general public stands by and watches the government take away teachers’ discretion, be aware that they are also taking away the general public’s equality. Instead of educating all citizens to be solutions orientated and trusting us to make decisions for our own well-being, they are giving us a script to follow because none of us, according to our current government, can be trusted to make wise decisions. I hear constantly that a socialist system like Finland’s won’t work in a democratic system like America’s. The irony is that Finland has more freedom and equality than our democracy does. 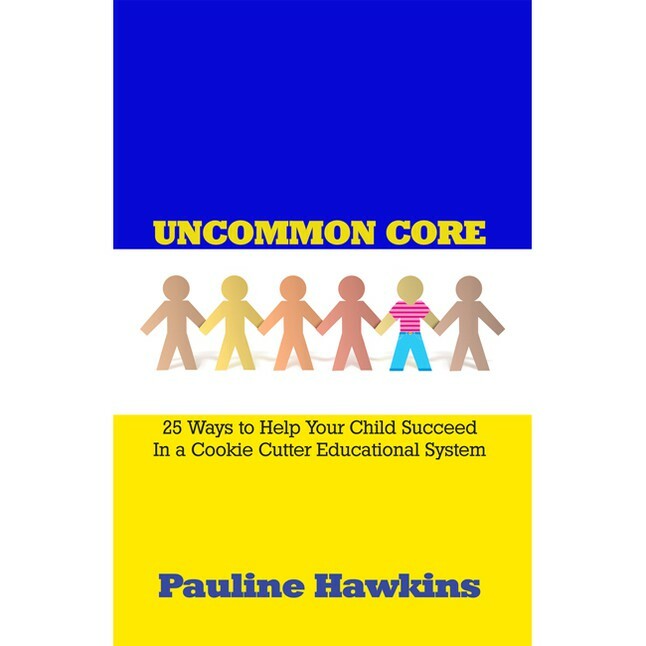 Their teachers are trusted to teach; their parents are trusted to make wise decisions for their children; their public is allowed to make their own choices. The wool has been pulled over our eyes; democracy is no longer the operating system of America. We are a capitalistic society being controlled by big businesses. There’s wonderful work happening in this country, but I have to say it is happening in spite of the dominate culture of education, not because of it. Many of the current policies are based on mechanistic conceptions of education. It’s like education is an industrial process that can be improved just by having better data. Policy makers believe that if we fine tune it well enough, it will hum along perfectly into the future. It won’t, and it never did. The point is that education is not a mechanical system; it’s a human system. It’s about people: people that either do want to learn or don’t want to learn. Every student who drops out of school has a reason for it, which is rooted in their own biography. They may find it boring, irrelevant, it’s at odds with the life they are living outside of school. There are trends but the stories are always unique. Alternative Education Programs: these are programs that are designed to get kids back into education. They have certain common features: they’re personalized, they have strong support for the teachers, close links with the community, and a broad and diverse curriculum that involve students outside of school as well as inside of school. And they work. What’s interesting to me: these are called alternative education. If we all used this system, there would be no need for the alternative system. This is the key to changing our current education problems. If we ran all public schools like an alternative education school, there would be no more drop outs. Students could explore what they are good at and passionate about. We would have smaller class sizes; students will be engaged because they will have more choices and will want to learn what they choose to study. The culture of the school is absolutely essential. Culture is an organic term. Death Valley isn’t dead; it’s dormant. Right beneath the surface are the seeds of possibility, waiting for the right conditions to come about. With organic systems, if the conditions are right, life is inevitable. There are public school systems in this country that look like Death Valley. There seems to be little to nothing growing in their schools; however, if we pour the right mix of money and quality teachers into each school, we will see growth. You take an area, a school, a district you change the conditions, give the students a different possibility, you give people the discretion to be innovative and creative. Schools that were once bereft will spring to life. Great leaders know this. The real role of leadership in education is not and should not be command and control. The real role of leadership is climate control, creating a climate of possibility, and if you do that, people will rise to it and achieve things you completely did not anticipate. We need real leadership in this country, not command and control. If we sit back and do nothing, we will have lost an entire generation of people to this standardized, one-size-fits-all mentality. A real leader will put the right people in charge and then get out of the way. A real leader will create a climate of possibility, not limitations. The recipe might be slightly different for each socioeconomic area, but the bottom line is we can meet each child’s needs in a school system. How? By taking back the funds handed over to big businesses. If we stop pouring billions of dollars into standardized state tests, we could stop this downward spiral. Imagine what we could do if that money went back into the school system: we could hire more teachers, decreasing the student/teacher ratio from 30-35 to 1 to 15-20 to 1, allowing for more individualized instruction; we could provide free meals and snacks to children who often go without meals, but are expected to learn at the same rate as everyone else; we could attract better qualified people to the teaching profession by offering more competitive salaries, giving the profession the respect it deserves; we could offer more vocational choices for students so they could join the workforce as contributing members of society right out of high school, instead of having dropout rates skyrocket, limiting their earning potential. It can be done, but we need to make a stand. 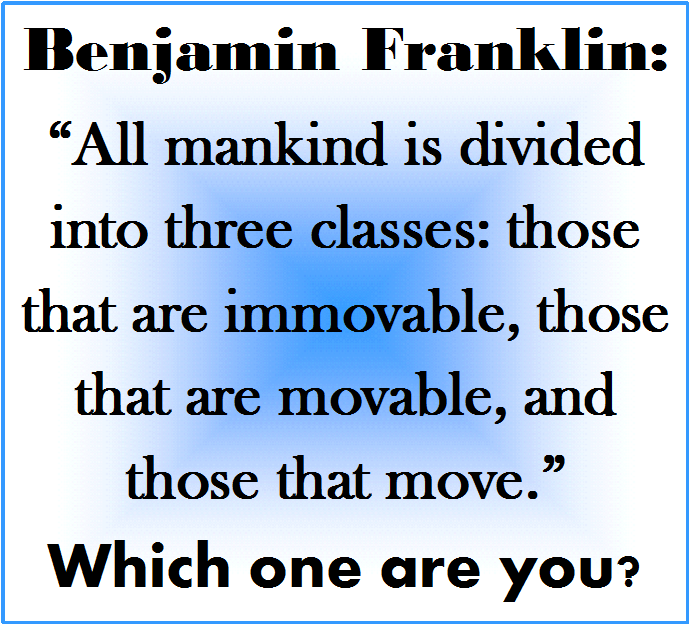 Quote from Ben Franklin: There are three sorts of people in the world: those who are immovable (people who don’t get it, won’t get it, don’t want to know about it), there are people who are movable (people who see the need for change and are prepared to listen to it), and there are people who move (people who make things happen and if we can encourage more people, that will be a movement, and if the movement is strong enough, that’s, in the best sense of the word, a revolution). And that’s what we need. We need a revolution, but first we need people who are willing to move. I’m willing to be that person who makes things happen. How about you? This entry was posted in Come Hell or High Water, Education Reformation, True Reformation and tagged Children, Education Reformation, Family, Parents, Sir Ken Robinson, Students, Teaching. Bookmark the permalink.